The hatred and the rivalry is back. And in a big way! After Game 5 on Oct 12th when the Cowboys beat the Eagles, I said it was fun to hate the Cowboys again. The team we love to hate was back, Well there is one thing better than hating the Cowboys and that is thumping them into submission. You could almost hear Parcells crying uncle at the end of the game. Trying to just run out the clock to keep the embarassment to a minimal. It was a beautiful site to see. It almost brought a tear to my eye. The final score was Eagles 36 and the Cowboys 10. But I wanted more! The 26 point differential wasn't enough to erase the years of hatred I have stored up. And adding the hated Ex-Giant coach to the mix only makes to rivalry better. Seeing his face after the loss is priceless. The only thing that would have sweetened the pot would have been to see their weasel owner Jerry Jones's face. Why didn't he show up on the sidelines at the end of the game??? That no good rotten @#%&! . Sorry about that, I just got a little carried away there. Arrgghhh. "Sereninty now. Serenity now". I'm alright now. Were you worried in the first half when it was 10-10? I think you might have been a little.Well it was certainly a close matchup because Dallas was able to run the ball. That was Parcells plan, to shorten the game by running the ball and keeping it out of the hands of of QC (Quicy Carter). Because in his heart, Parcells knew the Eagles were the better team. But in the second half , it was a different story. The Eagles clamped down on the Cowboys forcing QC to throw 2 picks. Donovan had a strong game. The NFL player of the Month for November, threw for 248 yards, 3 TDs and was 19-35. 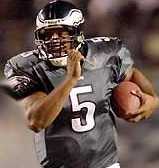 Make no mistake about it, the Eagles go how Donovan plays. Kudos to Duce, Buck and Westbrook , all with touchdowns. The defense tightened up in the second half when they needed to. In fact the 3 starting receivers for Dallas did not catch one pass all day. Two interceptions --- one each from Sheldon Brown and Bobby Taylor. Bobby played better this week than last week. He had a lot of rust last week. The Eagles have now won their eighth straight game, climbed to 10-3 and have taken a commanding two-game lead in the NFC East with just three games left to play in the regular season. They also clinched a playoff berth. It was a great Sunday. The kind of win that makes the work week go a whole lot easier. Smiles comes easier. But underneath those fan smiles, our undying hate still remains for the Cowboys. When you smile at another Eagle fan this week, you'll feel that common bond. HATRED FOR THE BOYS AND THE PLEASURE OF KICKING THEIR BUTTS. The Cinderellas of the National Football League for the first half of the 2003 season have turned back into a big fat pumpkin. The Dallas Cowboys who darted off to a 5-1 record had their 10-gallon hats handed to them by the Philadelphia Eagles, 36-10. As the pressure of the playoffs has approached Bill Parcells and the Cowboys have been shooting blanks. The Cowboys were able to add up the wins by defeating the likes of both New York teams, Arizona , Detroit , and a then hapless Eagles team. The Cowboys have not been able to rise to the challenge as the competition has increased. They were shutout twice on the road by Tampa Bay and New England , disgraced by Miami on Thanksgiving, and put out to pasture by the Eagles. The Cowboys have not only been beaten on the scoreboard lately, but have been beaten physically and emotionally as well. The star is not shining so bright in Dallas this holiday season and the smoke and mirrors have vanished to reveal Jerry Jones still pulling the strings. � America's Team� was replaced by the real America's Team; the first capital in America, Philadelphia, and its symbol, the Eagle. The Tuna came to South Philadelphia and left wrapped up in a newspaper and put in the freezer till next year.